Home › Grip Strength Trainer - Relieve Wrist Pain Carpal Tunnel. Grip Strength Trainer - Relieve Wrist Pain Carpal Tunnel. No matter you're working or exercising, you are overusing your gripping muscles while under-using your expanding muscles. Expanding muscles are the muscles that open your hands. Lacking of training these muscles cause imbalances that hurt performance & can cause pain & injuries such as carpal tunnel syndrome and tennis elbow. If you are musicians, golfers, computer workers, tennis players, baseball players, rock climbers, weight lifters, or if you drive, text or type, Try our Grip Strength Trainer, designed to increase the strength of fingers, wrists and forearms. Improve strength for weak hands - Improves strength, prevents stiffness and relieves joint pain. 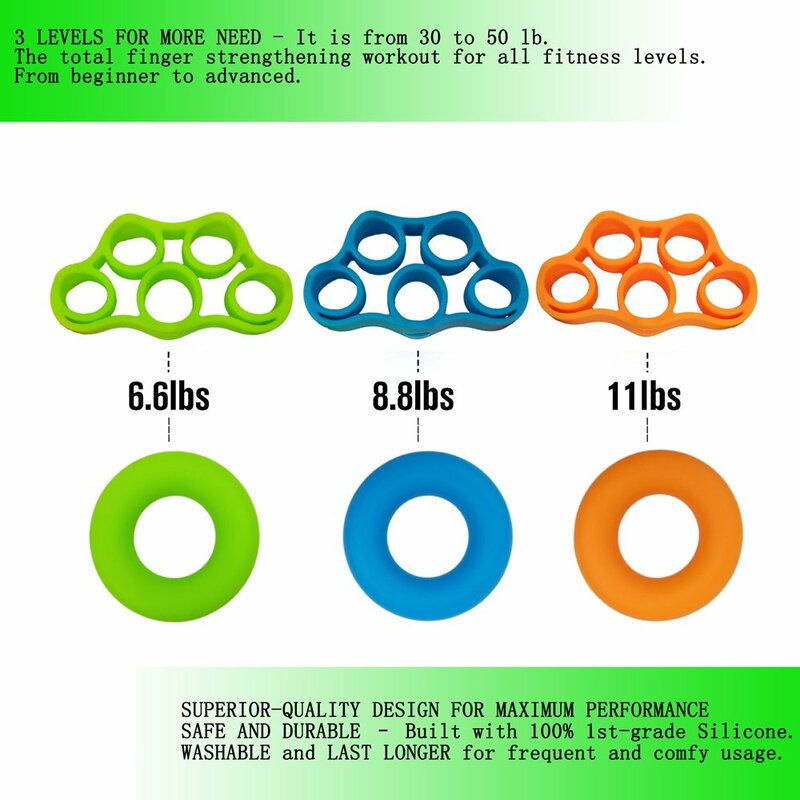 SUPERIOR-QUALITY DESIGN FOR MAXIMUM PERFORMANCE - SAFE AND DURABLE - Made of top-quality Silicone, not easy to tear. It is WASHABLE and can be use frequently and comfortably. 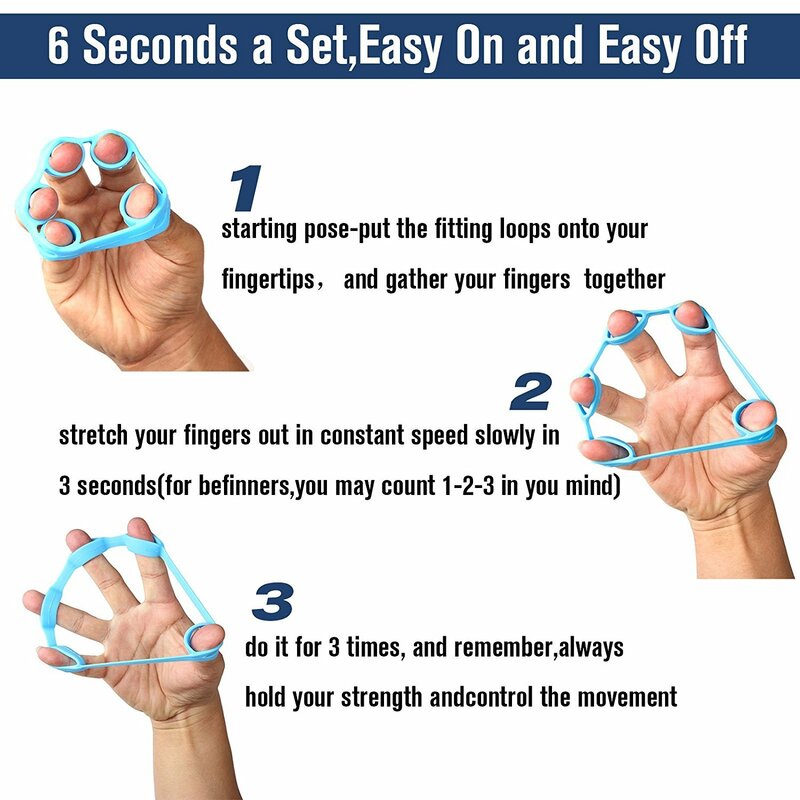 FITNESS & SPORT ENTHUSIASTS - strengthen your wrists, improve the dexterity of your fingers and increase the strength your hands can apply while reducing fatigue. Its rally value is from 30 to 50 lb. Help balance your grip muscles and your expanding muscles. REHABILITATION & PREVENTION - Great for rheumatoid arthritis, arthritis, carpal tunnel, tendonitis, tennis elbow and are on the way to recover from a fractured or broken wrist, or when you type, text or any other activities which use your gripping muscles. ERGONOMIC DESIGN FOR ALL HANDS - Suitable for all age groups and fits well for all hand sizes, different from other "small finger holes bands" on the market. Portable and easy to fit in bag or pocket. You can get repetitions in while driving, at the office or anywhere! WHAT YOU GET - 3 Finger Stretchers & 3 Hand Grips + Our Worry-Free 18-Month Post-Sale Guarantee and Friendly Customer Service !! Try It and You Will Love It!! How to use finger exerciser? Tip 1: Place loops over each finger, starting with fingertips close together. Tip 2: Slowly spread the fingers apart, hold for 3 seconds, then relax them slowly. 1 to 30 repetitions in three sets. - GREEN: Light Resistance - For Beginners and Injured Hands. - BLUE: Medium Resistance - For Everyday Strengthening Exercise. - ORANGE: Hard Resistance - For Advanced Muscle Toning.